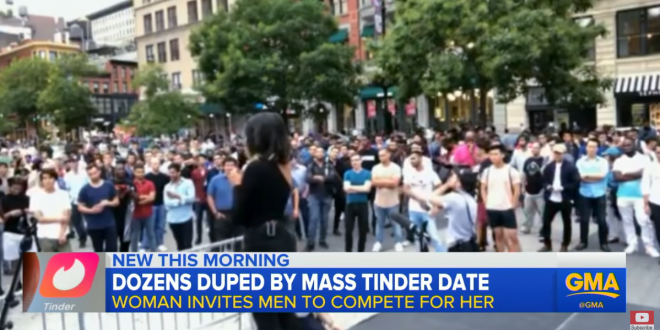 Marketing Company Dupes Dozens Of NYC Men Into Showing Up For "Tinder Date" With Model [VIDEO] - Joe.My.God. Natasha Aponte is a New York-based model who isn’t afraid of some drama on a first date. Over the past month, she’s been using Tinder to arrange for hundreds of guys to meet her at the same place, at the same time, unbeknown to each other. Once they had formed an audience, each thinking the rest of the men were just there for a show, Aponte took to the stage, explained what was going on and started whittling down the guys with questions and challenges, saying that the winner would actually go on a date with her. This being 2018, you can’t just fool a bunch of people and then sit back and savor the sweet smell of success—you need a camera crew and some kind of angle to ensure that every glimmer of spontaneity is spliced and edited down to a deliciously consumable, two minute piece of Content. Bliss, who helped produce the 2014 video about a woman being catcalled while she walked through New York City for ten hours, and made a viral anti-bullying video in 2015, says he’s behind this stunt as well. Natasha Aponte, whose Tinder profile and subsequent messages made it all possible, referred our request for comment to Bliss. The scam came to light after a man, who asked only to be identified as Misha, tweeted a now-viral thread about falling for the date scam. Misha said he matched with Aponte on Tinder “a few weeks ago,” and after chatting a little on the app, they moved over to text messaging. (Okay, sounds normal.) After texting some more, Aponte told him she was busy with a work “presentation,” but would text him again in a few weeks when she had more free time. Misha assumed she was ghosting on him, but to his surprise, Aponte texted him again a week later, inviting him to meet in Union Square where she said her friend was DJing. He agreed — as did, unbeknownst to Misha, many other men. A number of men Select All spoke with confirmed a similar pattern of events, from meeting her on Tinder to the texting hiatus to the out-of-the-blue date invitation to Union Square. While most of the hundreds of men left almost immediately out of embarrassment, dozens of others were dismissed from the stage by Aponte for being too short, having beer bellies, being smokers, and for other cardinal sins. The finalists then competed in various contests. USA! USA!